New stepped plazas will be built along the edge of Singapore River at Queen Elizabeth Walk and in front of the Asian Civilisations Museum. Cementing a bold vision laid out in an urban master plan last year, the authorities here said work has started to reclaim the city's civic district from the car. The area around the Padang - encompassing landmarks like Victoria Theatre, the National Gallery and Esplanade Park - will be turned into "a walkable park" within an "arts, culture and lifestyle precinct", said National Development Minister Khaw Boon Wan. "Our civic district is full of history, memories, monuments and beauties," the minister wrote on his blog yesterday. "Over the years, huge assets have been assembled there, but their full potential is not being realised." 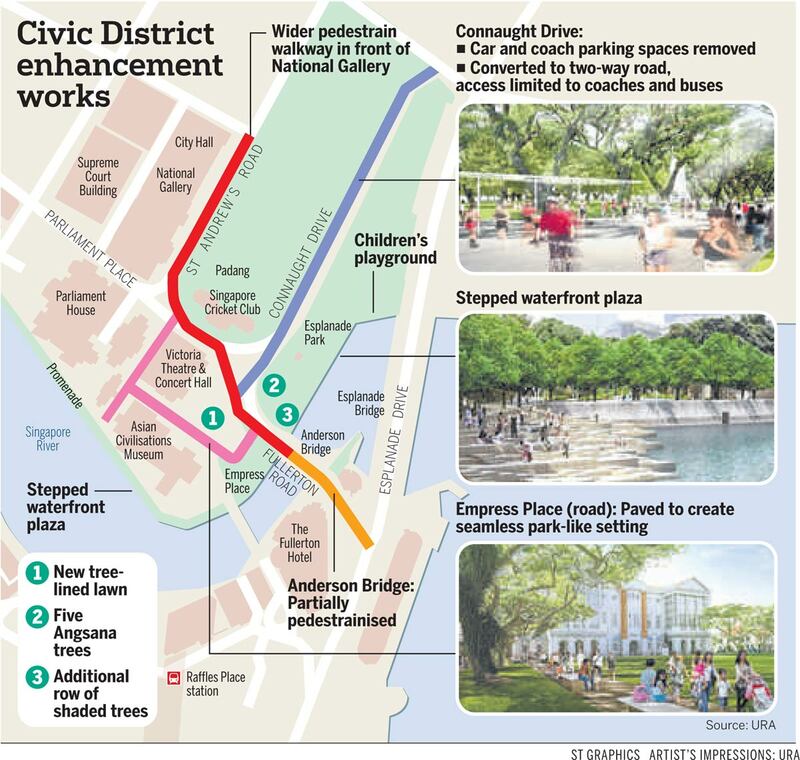 To unleash this potential, traffic access to the area will be crimped, with roads like Empress Place paved over and Connaught Drive accessible only to buses and coaches. One side of the historic Anderson Bridge will be converted to a footpath. Most of the reconstruction - which will cost $66 million - will be completed in phases next year, in time for the various SG50 celebrations. For instance, part of Fullerton Road will be realigned to free up more lawn space in front of the Asian Civilisations Museum. Likewise, a more spacious walkway will be built along St Andrew's Road. These will be ready by next July. Work has already started to remove kerbside parking spaces in Connaught Drive. The stretch will be paved and landscaped so people can walk, jog, cycle and skate there. Along the edge of the Singapore River, where Queen Elizabeth Walk sits, a stepped plaza will be built to bring the public closer to the water. Harking back to the days when the area was a favourite haunt for courting couples, five Angsana trees will be planted in Esplanade Park near Anderson Bridge. They mark the spot where five such trees stood, up to 1990. To mark SG50, an 8km Jubilee Walk will connect attractions in the area, with trail markers to tell stories of Singapore's progress. The transformation plan is reminiscent of similar moves by cities elsewhere to claw back road space. San Francisco did away with the Embarcadero Freeway after it was damaged by an earthquake in 1989. In its place, a wide boardwalk now fronts the bay, frequented by joggers, cyclists and those who want respite from the city. About 10 years ago, Seoul tore down a highway to uncover the Cheonggyecheon river and create an oasis in the city. National University of Singapore transport researcher Lee Der Horng gave the plan the thumbs up. "It allows residents and visitors a greater opportunity to immerse in the city and to enjoy the city," he said. "We should have more of this."